Help us spread the word about Team Canada Foosball by sharing our 2013 Media Pitch. You can view it online and share it here. Storage Wars Canada – October 2013 – CanadaFoosball makes an appearance on a segment of Storage Wars Canada to valuate a table. Canada AM (NOTE – if Chrome does not work, try another browser) – December 29, 2012 – Nhu and Mario live on national talk show CTV’s Canada AM. The Hamilton Spectator – Thursday, December 22, 2011 – Nhu Tran is interviewed by the local Hamilton newspaper. CBC’s As It Happens – Tuesday, January 3, 2012 – The Edmonton members are interviewed before heading off. Montreal’s La Presse – Saturday, January 7, 2012 – Mario Iannuzzi is interviewed while in Nantes. The Jason Gregor Show – Thursday, January 12, 2012 – The Edmonton members are interviewed after their return. CBC’s Radio Active – Friday, January 13, 2012 – Darcy Scaife is interviewed about Team Canada. 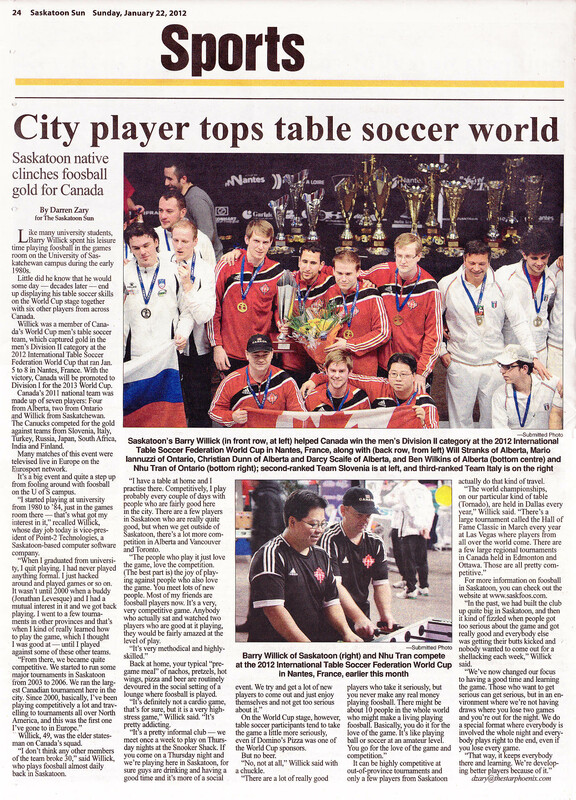 The Saskatoon Sun – Sunday, January 22, 2012 – Barry Willick chats about clinching gold for Canada. The Edmonton Journal – Monday, January 30, 2012 – The four Edmonton members talk about the international victory. CBC – February 29, 2012 – The Edmonton members strike again with another video interview. CTV2 – Alberta Primetime – Friday, March 9, 2012 – A mini-documentary feature on Team Canada. How about a translated version of Montreal’s La Presse! I am opening a bar downtown toronto in 20 days . And am looking for a fooseball table that is heavy duty as well as looking nice for about 300$ and don’t know where to buy it.